Keith Spike in the outdoor yard connected to his living quarters at Falkenburg Road Jail in Tampa, Fla.
Last week, President Barack Obama used his pardoning power to commute the sentences of 61 additional nonviolent drug offenders in an effort to at least moderately correct the insurmountable injustices delivered through America’s war on drugs. The war on drugs (and the mass incarceration that is its result) is heavily in the news because of President Obama’s pardons, a recently publicized claim by an aide of President Richard Nixon that the war on drugs was created to target blacks, and attempts by activists to hold presidential hopeful Hillary Clinton accountable for what many believe to be her role in the adoption of the $30 billion crime bill signed into law by her husband in 1994 when he was president. That crime bill—which, to be clear, Hillary Clinton supported and lobbied for—cemented the United States as the nation with the most prisoners in the entire world. For decades, stories of mass incarceration have been told through the rhetoric of statistics­—through numbers, mostly—but Zara Katz, a photo editor and visual producer, and reporter Lisa Riordan Seville have decided that it is past time to present more compelling (and more human) stories of prisoners, ex-prisoners and those who love them by curating a captivating visual storytelling project on Instagram (with an accompanying blog on Medium) called Everyday Incarceration. The Root spoke with Katz and Seville via email to discuss their inspiration for Everyday Incarceration. The Root: What made you decide to take on Everyday Incarceration as a visual storytelling project? Lisa Riordan Seville: It was an experiment in curation and collaboration. I’m a reporter and have worked on criminal-justice issues for several years. Zara is a photo editor and therefore consumes most of her news through pictures. As criminal-justice reform became a topic of debate, Zara and I wondered what would happen if we tried to look at the legacy of mass incarceration through pictures. Zara Katz: So often in journalism and media, the narrative is decided before the content is produced. Going into this experiment with only the question, “What does the legacy of mass incarceration look like?” has revealed a narrative that is not talked about as often: How does one live on the outside after experiencing correctional control; what happens to a community that has had three generations cycle through the system; what is the experience of those people, mainly women, who support loved ones who are locked up? TR: Why Instagram? Why this kind of micro photojournalism? ZK: The choice of Instagram was in part utilitarian. It’s a social media platform based on pictures. It’s also harder to reshare pictures without the captions and credit, something we were concerned about on other platforms. We also thought photos like those we feature might stand out on this platform because it’s not, in most feeds, the average fare. 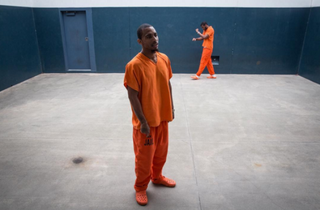 One unexpected outcome of using Instagram as our platform has been the connections with individuals and groups that have had direct experience with incarceration. TR: How have your views on the U.S. prison system changed from when you began the project to where you are now in continuing the project? LRS: I’ve spent the last 10 years reporting or working on criminal-justice stories. And honestly, I just continue to have more questions than answers. The photographs are not my work, but they prompt me to ask questions. Most of those questions have to do with life after prison. I suppose the greatest change in my views of the prison system is I’m increasingly interested in the impact prisons have on people and places beyond just the four walls of a facility. ZK: It has been a moment of reckoning for me on the imbalance of who has knowledge of this system and who doesn’t, not just as a matter of who is locked up, but who is supporting them. This is not something that I have had to do, and therefore my knowledge completely comes from looking and listening to their stories. I realize how easy it could be not merely to ignore but to not even know where to look. TR: The humanity conveyed in the images of prisoners, ex-prisoners and their families is captivating. Why is this an important aspect of combating mass incarceration and our overall ideas about the prison-industrial complex? LRS: Journalists always strive to question the impact of policy. We spent 40 years, and billions of dollars, creating this system. It’s fitting to examine it, as we examine most of our policies and institutions. It’s fitting to ask, did it meet its goals? I think if we omit voices like Bessie’s for fear that it will send the wrong message, we’re in fact not listening to those who have perhaps the greatest expertise on prisons. TR: You mentioned that you are two white women who have no relatives in the U.S. prison system, yet the stories you tell through this project are overwhelmingly of black and brown people. Was this intentional? LRS: You can’t talk about criminal justice in this country without talking about race. Black people are incarcerated at six times the rate of whites. Much of the photography around prisons reflects that—you see many black and brown faces because that’s who is there. I don’t think we had to be that intentional about capturing that. It was nearly inevitable. TR: Many of the stories you offer as part of the project are of people leaving prison. How do you see this kind of “second-class citizenship” play out with those attempting to readjust their lives outside prison? LRS: What we’ve seen is that the impact of prison does not generally end on the date of release. For one, many people continue on supervision, whether probation or parole. Their job prospects are diminished. Their families have been disrupted … an advocate we spoke to recently mentioned that though we often talk about the re-entry process from the perspective of the person returning from prison, it also has a huge impact on the family they go back to. It’s 50-50, she said: half the readjustment of people coming home, and half of their families adjusting to them being there. TR: What can we do, as everyday citizens, to effect prison/prisoner/ex-prisoner reform? LRS: To talk about the human impact of prison is inherently political. Many come from the perspective that to talk about prisons, to take pictures of prisons, is advocacy. Maybe it is. In the case of criminal justice, many people seem to think to broach the subject is to come to a conclusion. We were more interested in asking questions. With that said, I would suggest other people ask questions, not just of their policymakers and others, but of themselves. Our prisons today are in part a product of our ideas—said or unspoken—about race and class. They are a very good mirror on our society. And I think we should ask what we want to see when we look in it. For those interested in sharing images for @everydayincarceration, photos for consideration can be emailed to everydayincarceration@gmail.com. Josie Pickens is an educator, culture critic and griot whose work focuses primarily on race and gender. Follow her musings on Twitter.